Wensleydale cheese has a fabulous, creamy flavour and a crumbly, almost Feta-like texture. Here, I've partnered it with buttery leeks and parcelled it in puff pastry with a lovely, ginger-spiked pear and prune chutney alongside. If time is short, Waitrose Plum and Ginger Sauce with Balsamic Vinegar is a good substitute for the chutney in this dish. Spread out the puff pastry on a floured surface and cut out 12 discs, each with a diameter of about 12cm (an espresso saucer is a good template). Chill these discs while you make the filling. Trim and wash the leeks and slice thinly. Melt the butter in a pan over a medium heat and fry the leeks till soft but not coloured; about 10 minutes. Stir in the honey and rosemary. Season to taste and leave to cool. Crumble the cheese and stir into the leek mixture. Lay 6 of the pastry discs on a baking tray and divide the leek mixture evenly between them, spooning it into a neat mound in the centre, leaving a rim of about 1cm around the edges. Brush the borders with the beaten egg and cover with the remaining discs. Crimp the edges to seal. Score a pattern of radiating lines from the centre of the parcels outwards, taking care not to cut through the pastry. Brush with more beaten egg and bake for about 20 minutes, until puffed up and golden. Serve hot or warm with a spoonful of the pear, prune and walnut chutney. 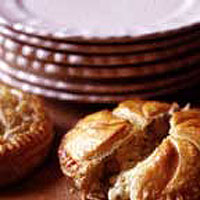 If necessary, the pithiviers can be made a few hours ahead of time and reheated.